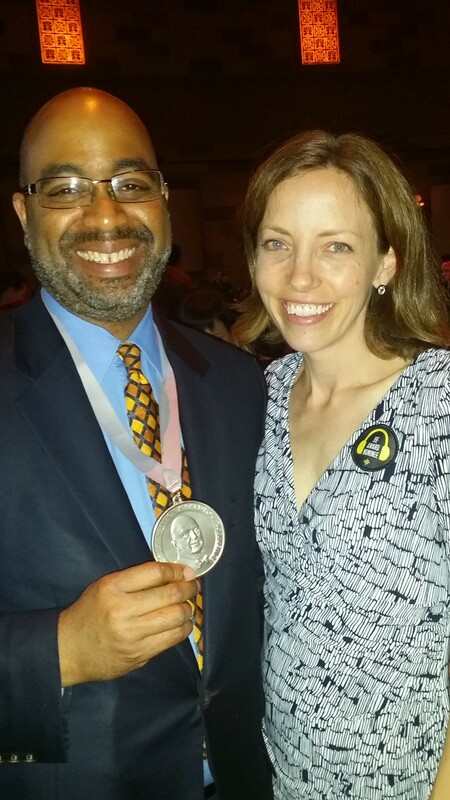 Adrian E. Miller – Soul Food Scholar » 2014 James Beard Foundation Award Recap–“Soul Food” Wins! 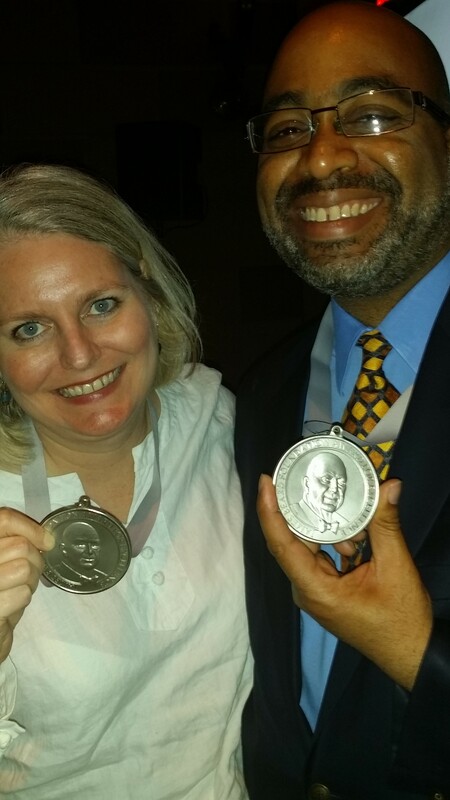 2014 James Beard Foundation Award Recap–“Soul Food” Wins! 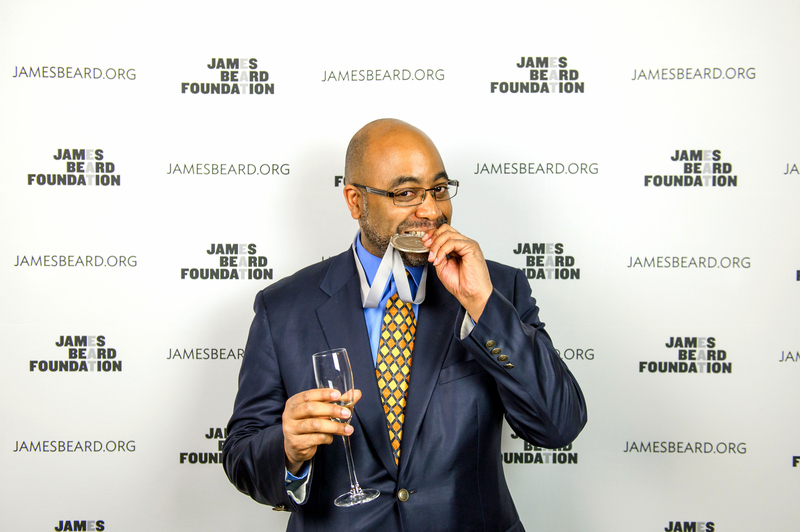 You may not know that there are two James Beard Foundation Award ceremonies–one for those who talk about, televise and write about food and the more well-known other for the chefs and the restaurants. Here’s a look at the room. 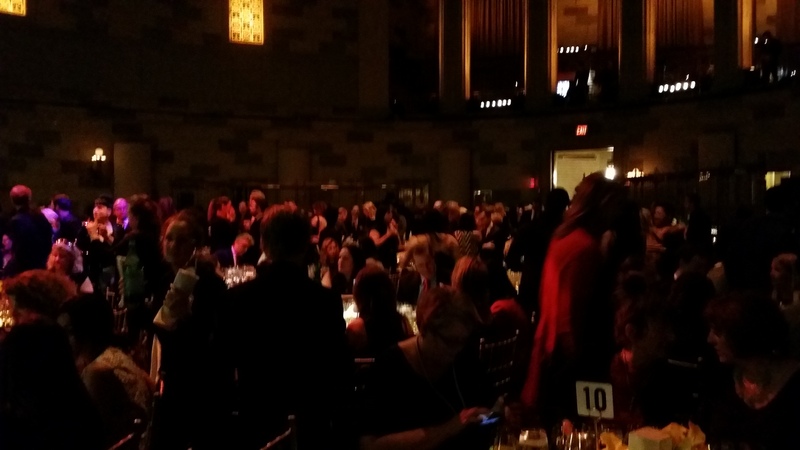 Even though thee James Beard Foundation Awards are called the “Oscars for Foodies,” the ceremony reminds one of the Screen Actors Guild award that once attended–you’re sitting down for a nice dinner instead of an auditorium. 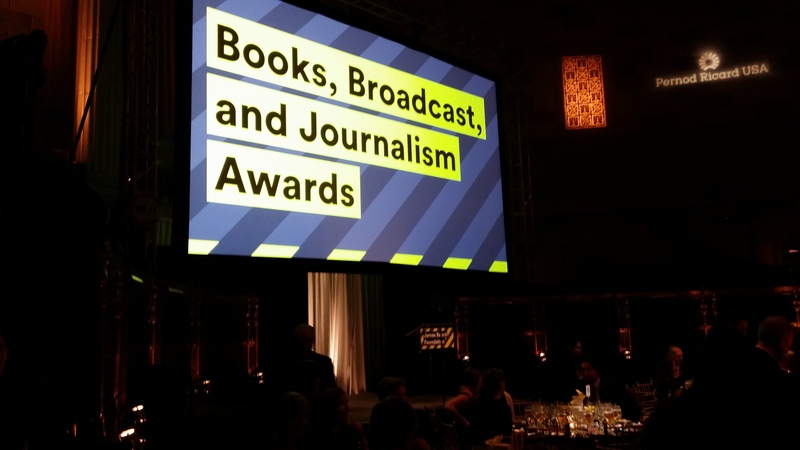 I had been warned by previous attendees that the awards were going to run all night, so I was quite surprised that this appeared so after I sat down and started eating dinner. I had to seriously scramble to get this shot before it disappeared forever. The incomparable Lidia Bastianich (look at the bottom of the first picture) introduced my category (“Reference and Scholarship”), and listed the nominees. Then it happened, Soul Food won! What an amazing feeling! When I collected myself, I expected to hear polite applause but there were actually screams of support. I had a lot of love in that room. “Wow! This is really cool! Lots of people came up to me during the course of the weekend, and told me that I gave one of the best acceptance speeches. Just another way to make a brown man blush. I returned to the my table, and not too long after that, Lisa Fain who was sitting two chairs to my right at the same table won for “Individual Food Blog”! I won’t repeat what she said, but suffice it to say, she was pretty surprised that she won. After the southern cheese plate, I got this chance to “cheese” with her. I met Lisa (pictured below on the right) several years ago at a Southern Foodways Alliance Symposium in Oxford, Mississippi. Congrats again, Lisa, and you should check out her Homesick Texan blog! 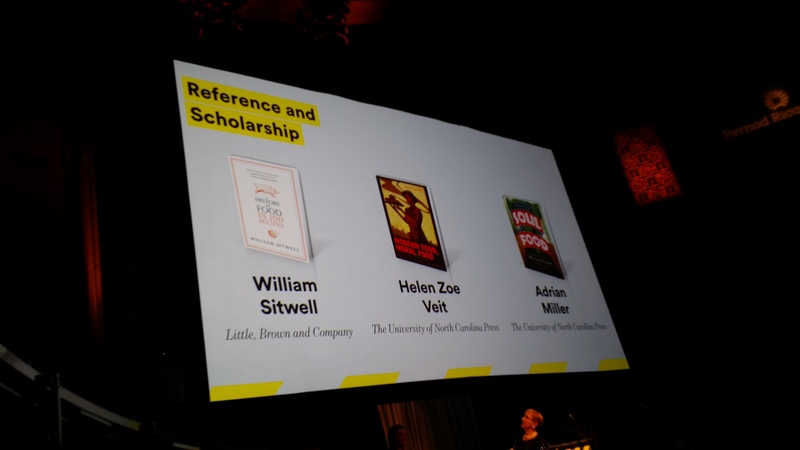 I also want to acknowledge my fellow UNC Press author Helen Zoe Veit (pictured on the left) who was up for the same award for her book Moral Food, Modern Food. She was wonderful to me the entire time, and I hope that you check her book as well. A wonderful night that I’ll never forget! Thanks again to the James Beard Foundation for choosing Soul Food. Do you walk around wearing your medal? No. What better way is there to show that the whole thing has gone to your head? Do you sleep wearing your medal? No. My stuffed animals would get jealous. Do you shower wearing your medal? No. I’m not a freak. Nope. 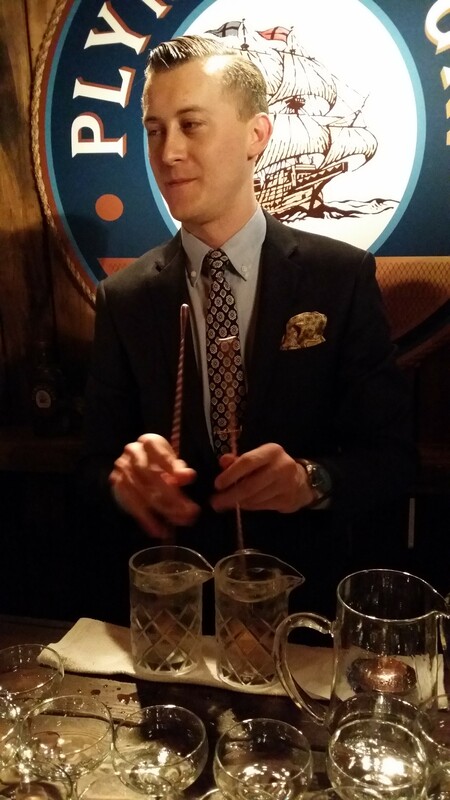 I’m just a curious guy with an appetite for history and great food. No. Who would want to do all of that work? Is your book a cookbook? No. Though it contains recipes, it’s really a narrative history. Do you feel like you’ve won an “Oscar for Foodies”? Absolutely! 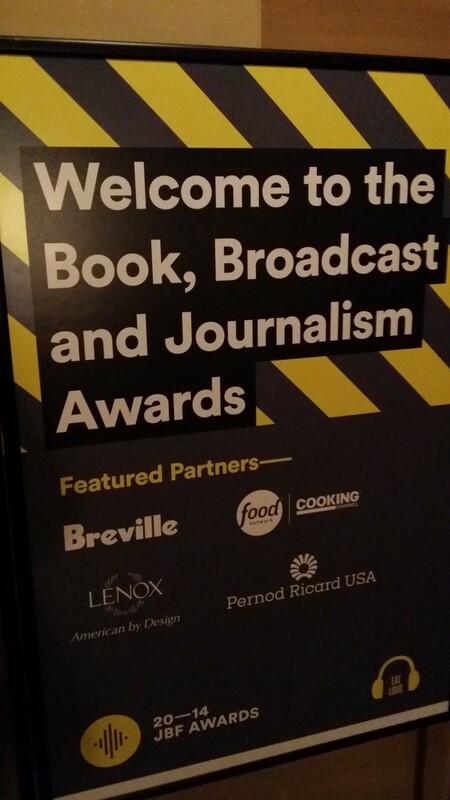 This is one of the highest accolades that I could get as a food writer. I’m already comparing myself to George Clooney and Jamie Foxx (oops, wrong category . . . they’re actors). That’s it. Those, especially the first three, are the most frequent questions I’ve gotten since winning the award. For more practical and less personal questions, like “Who was James Beard?” and “What does this foundation do?,” check out www.jamesbeard.org/about.